I debated about even showing you my outfit from yesterday- because really- it isn’t that fashionable! I just thought it was sort of cute…and definitely better than the outfit on the right. But then I remembered that pre- Everyday Mom Style– knowing what to wear to children’s sporting events used to be a struggle for me. Do I go with yoga pants and a sweatshirt? Jeans and a cardigan? What do people wear to these things?! I figured if there are other moms out there wondering what to wear to their kids games- than maybe I should go ahead and post my outfit. Luckily, yesterday it was over 80 degrees, so I didn’t need multiple layers (like I usually do), so I opted for a simple shorts and tank combo. To make the outfit bright and interesting, I went with these cute madras plaid shorts and a pink tank. To keep my look polished, I added a long necklace and cute leather sandals. It was cute, comfy and weather appropriate. Too bad my daughter’s team lost… oh well, there’s always next week! Go Flyers! June 3, 2012 June 3, 2012 by Megan7 Comments on June 3rd, Where’d You Get Those Cropped Jeans? Ok, so my title is a little misleading. You won’t really lose 5 pounds in 5 seconds- but look at my picture on the right compared to the left. A belt makes all the difference! I hesitated belting the sweater- but as soon as I saw the photo I knew it was the right choice. The sweater is a bit shapeless, and by adding the belt I am now defining my waist- and also making my legs look longer- how is that possible? Let me explain. Basically it’s all about balance. Outfits need to be divided into thirds- not halves. In the picture on the right my body is divided into half- the top half and the bottom half. By adding the belt- the balance changes- and now the bottom half (below the belt) is larger- 2/3 of the outfit, while above the belt is 1/3. I know, I know math on a Sunday morning- it’s too much! Go enjoy your day. And a quick thank you to Mother Nature for another sunny day. I love you! By defining my waist I look thinner. 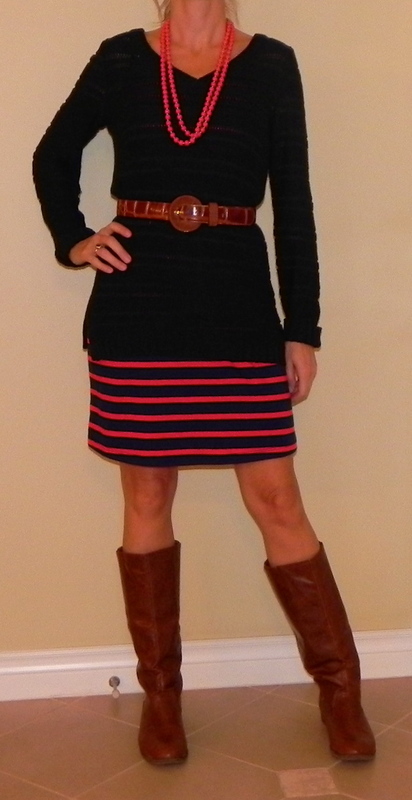 Skirt: Nordstrom, Sweater: Old Navy, Shoes: Target, Belt: so old I can’t remember! LOL! One thing I’ve learned in this ‘fashion journey’ is how a very simple outfit can either look stylish or not- depending on small details. A good example of that is today’s outfit. I’ve paired blue jeans with a white t shirt and a black cardigan. But- as you can see on the right, this outfit is awful. The loose, baggy jeans are too long (see how they puddle around my ankles). The white t shirt has a neckline that is too high- and the cardigan looks awkward (the neckline is so much lower than the t shirt). And to be honest, the outfit is just a little too boring. I’ve switched out the cardigan for this longer, short sleeve one and then added a scarf to add interest and color to the outfit. Now my outfit has a focal point. For my shoes, instead of the ugly black Sketchers (on the right), I’ve got on cute black ballet flats. Simple little changes that make a big difference! Enjoy your weekend. The sun in shining in Seattle today! Thank you Mother Nature! I love this faux Burberry scarf! Don’t forget to check out my Facebook page, and also to vote for Top Mommy Blogs. Thank you! Jeans: Old Navy, Cardigan: Standard Style Boutique (Kansas City), Flats:Nordstrom, Scarf: gift from hubby!